The Butcher's Block is a hefty array of cheese, charcuterie, nuts and dried fruit. Photo by Holly Beretto. The vibe of the space seems to reflect that welcoming energy back to the guests. Postino features a casual warehouse interior, anchored by massive windows looking out onto 7th Street and a large, inviting patio running parallel to Heights Boulevard. 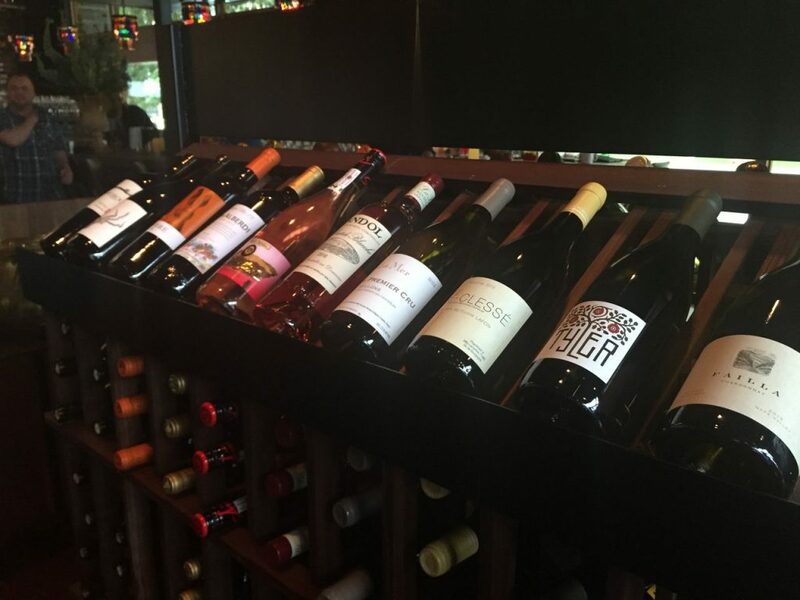 A selection of wines by the bottle and by the glass offer something for all tastes at Postino. Photo by Pamela Shamblin. Wine is definitely the big draw at Postino. Although the menu features noshes like cheese plates, panini and full brunch options, they seem designed to match the wine list, not the other way around. The eclectic, lighthearted list offers something for every taste, including imports and domestic selections that California winemakers produce exclusively for Postino. 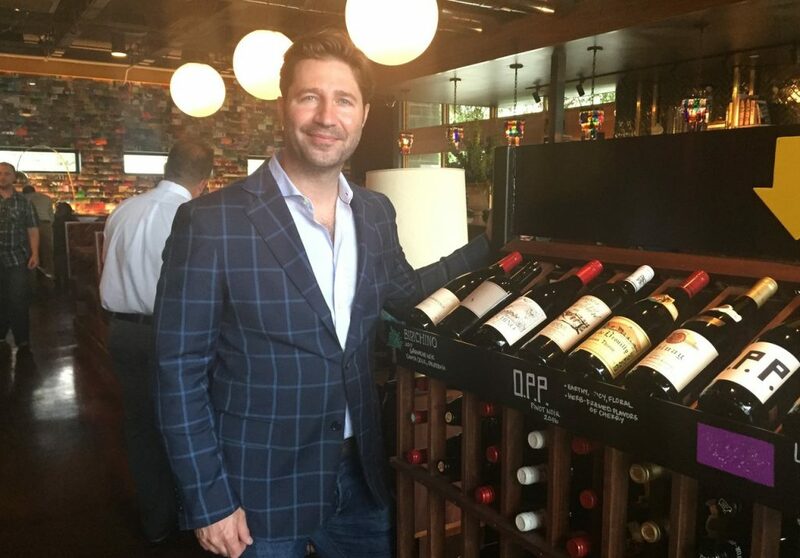 Houston wine lovers will appreciate that the by-the-glass list is $5 every day from 11 a.m. to 5 p.m.
Sommelier Brent Karlicek, who heads the wine operation for Upward Projects, has crafted the bottle experience for guests. There’s no list of by-the-bottle wines; they’re on open racks at the front of the restaurant. The idea is for patrons to talk to servers or managers about their preferences and wind up with a bottle that hits their personal sweet spot. With prices that range from just under $30 to $150, there’s a good chance at finding something for any budget. Sommelier Brent Karlicek has created a curated by-the-bottle selection experience at Postino. Photo by Pamela Shamblin. One of those is Ameztoi Rubentis, a dynamic rosé out of Spain, for $42. A bang of fresh strawberries and bright lemon on the palate proves perfect for Houston’s long stretches of perfect patio weather. The Frame Chardonnay, a Postino exclusive, is made with fruit from the Golden State’s Anderson Valley and Lodi. (Both are AVAs, or American Viticultural Areas, with distinguishable growing conditions, such as climate, soil, or elevation, that differ from surrounding areas.) The result is a snappy libation smacking of green apple and steely minerality. It’s available by the glass for $11 and by the bottle for $39. Red lovers should check out Redwood Alley, another Postino exclusive, also available both by the glass and the bottle. It’s a blend of Carignon, Syrah and Valdiguie from Mendicino County, resulting in a plummy, earthy, old-world sipper. The glass price is $11 and the bottle will set you back $40. The Butcher’s Block is a hefty array of cheese, charcuterie, nuts and dried fruit. Photo by Holly Beretto. 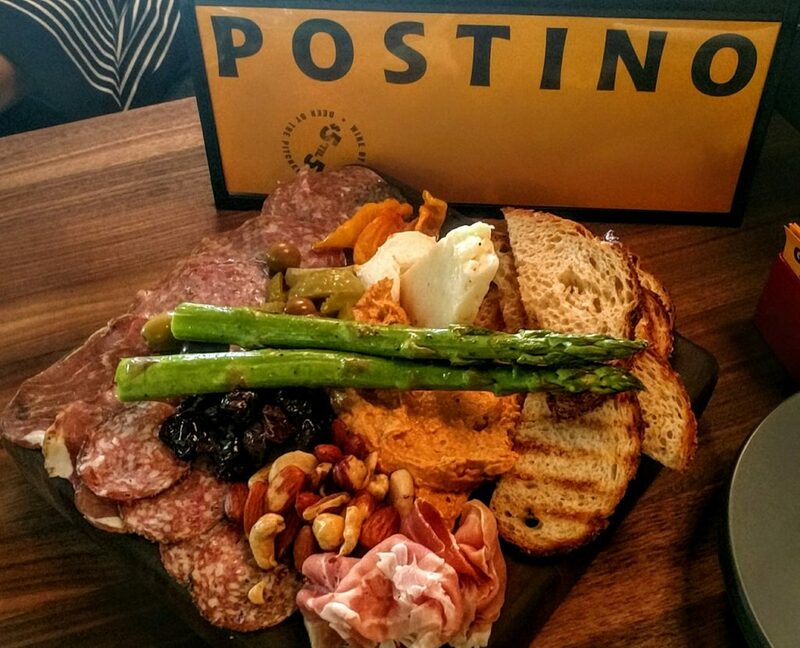 For food, guests should start with either the Butcher’s Block, a $15 assortment of Manchego, goat cheese, hummus, dried cherries, nuts, prosciutto, salami and toasted bread that will easily feed two or three people. Postino’s owners are proud of the bruschetta—and with good reason. Forget tiny toasts with tomatoes on top. These are huge slabs of chewy Italian bread topped with an array of options. Guests can select salty prosciutto with sweet fig; an earthy artichoke dip; roasted red peppers and goat cheese; or eight other selections. Those include brie and apples; smoked salmon and pesto; and ricotta with dates and pistachios. Panini and salads round out the menu. On weekends, there are brunch options, including French toast, Farm Scramble with eggs, Gruyere and white cheddar cheese and a breakfast panini on ciabatta with sugar-cured, smoked bacon, scrambled eggs and Dijonaise. Drink wine at this Heights cafe. Postino is open Monday through Thursday from 11 a.m. to 11 p.m., Friday from 11 a.m. to midnight, Saturday from 9 a.m. to midnight and Sunday from 9 a.m. to 10 p.m. The $5 wines-by-the-glass are available from opening until 5 p.m.